East Dorset, VTJuly 27, 2003-- Lisa Jacquin of Wayne, PA aboard Justice, owned by Dr. Juan M. Carmona , won the $35,000 Valley Classic Grand Prix Presented by The Equinox at the Valley Classic, July 23-27, the third week of the Vermont Summer Festival, July 9-August 10, held at the Harold Beebe Farm in East Dorset, VT. The blustering winds did not deter Jacquin, and on a day where many were affected by the rain and high winds, she proved herself to be the best. This year, were used to it, she said of the weather conditions. Going third in the jump-off, Jacquin posted a clear round and the fasted time of 43.903 seconds to earn the blue ribbon. Hes a great horse, she said of her mount. Lisa Jacquin riding Justice on her way to winning the $35,000 Grand Prix at the Vermont Classic sponsored by The Equinox Resort. For the third straight week, Jimmy Torano of Fort Lauderdale, FL took second place in the Grand Prix. With two mounts in the jump-off, Torano finished second aboard Gibson, owned by Sir Ruly Inc. This pair crossed through the finish line in a time of 44.650 seconds. Irishmen Darragh Kerins who is based in Wellington, FL in the United States, finished third aboard S&L 11th & Bleeker, owned by S&L Farms. Just prior to the Grand Prix, honored horse show guest Governor James Douglas presented Summer Gay of Ridgefield, CT and Katie Milton with Leading Lady Rider Awards. Gay was presented with the Leading Lady Jumper Rider award by the Susan G. Komen Foundation in honor of Breast Cancer Awareness. The foundation presented Milton with the Leading Lady Hunter Rider Award. Its quite an honor, said Milton, who has just recently entered the professional ranks. Milton works in Bridgehampton, NY at Waterside Farm. I love working for them, she explained. Earlier in the day, Kenzie Snyder of West Chester, PA aboard her Aquarius won the $10,000 Show Jumping Hall of Fame Junior Jumper Classic Presented by Nutraceutical International Inc. Snyder was one of only four-horse-and-rider combinations to ride clear over the first round course to qualify to ride in the jump-off. Going first in the jump-off, Snyder was the only rider able to produce a fault free jump-off round, which earned her the blue ribbon. Lara Gay of Ridgefield, CT aboard RCG Farms Rios Ricarda finished in second place posting a four fault score in the jump-off in a time of 33.927 seconds. Later, the Mexican riders dominated the $10,000 Show Jumping Hall of Fame Amateur-Owner Jumper Classic Presented by Nutraceutical International Inc. Marilly Meyer of Mexico aboard Lexington topped the field of 31 horse-and-rider combinations to win. 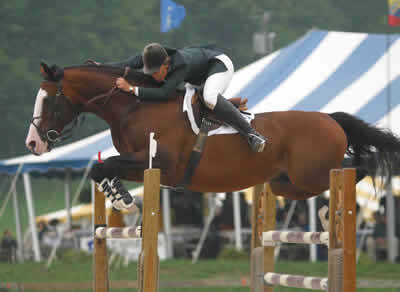 In the jump-off, Meyer turned in a clear round in the fastest time of 35.345 seconds. Another rider from Mexico, Armando Trope finished second aboard Karo As, owned by Armando Hassey. Armondo Hassey finished third aboard his Kosmanta.